As both a lifelong United Methodist and lover of architecture, I have been naturally drawn to the denomination’s local places of worship, most of which seem to be of quality construction. I have become even more interested in this topic in recent years due to the fact that my wife, Laura, is a recently retired United Methodist minister and pastoral counselor. Besides her counseling work, she also had two appointments quite different from each other in feel – and in the architecture of the buildings where she worked. 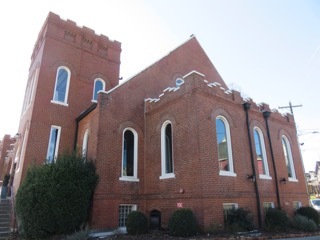 She first served three country churches where Hamilton, Bradley, and Meigs counties come together before being appointed to the large and Gothic-style Church Street United Methodist Church in downtown Knoxville. As a result of all this, I for some time have thought it might be neat to find some of the old Methodist church buildings in the older sections of Chattanooga and at least take pictures of the outside of them. What finally prompted me to do that, besides a van tour taken by a group of retired United Methodist pastors last year, was a china plate with a drawing of an old Chattanooga Methodist church on it that my wife found at a recent estate sale. Because of those two happenings, I am now somewhat familiar with such United Methodist churches as Asbury, Avondale, Manker Memorial, Ridgedale, and St. If one wants to find more information on those five churches, their times of worship and exact locations, you will not find them in a Holston Conference listing or even on a Facebook page. The reason is that they are no longer in existence due to mergers and/or closings. Information on them these days can basically be found only at the library in old newspaper clippings. But a visual examination and online search of the five buildings shows that at least two are still being used regularly as churches. And the one with its picture on the plate is actually still operating as a popular event center. But the other three are apparently not being used regularly as churches, or at least that appears to be the case. Besides these five churches, there are other pretty former United Methodist church buildings not far from downtown Chattanooga. They include the neat-looking former East Lake UMC with its Tudor-like inspiration, and the former St. Andrews UMC in Highland Park. St. Andrews in the mid-20th century was the second largest Methodist church in Chattanooga behind Centenary and is a real architectural gem, and that fact might be worth a story by itself. While I hope in the near future to possibly get tours of the insides of a couple of these five church buildings and do a follow-up story, I was content on Friday just driving by them and looking at them a little more closely. It was a way of paying tribute to my Methodist forebears in Christ, especially at a time when the denomination is anxiously looking this winter at how to stay together, if possible, over such issues as gay marriage and gay clergy. After leaving my home in Hixson near Northgate Mall and heading to East Chattanooga via Amnicola Highway, I found in sort of a roundabout way the former Manker Memorial Methodist, located at 2625 N. Chamberlain Ave. 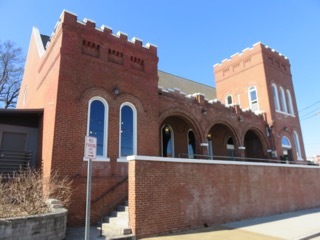 While not located in a heavily frequented part of town, this church just north of the Glass Street intersection in the heart of East Chattanooga is a very handsome building. Of multi-toned tan and brown brick, it features giant stained-glass windows, cross shapes built into or adjoining the brick in various places, and arches of different shapes. It is entered in the front by climbing some steps into three sets of double doors. 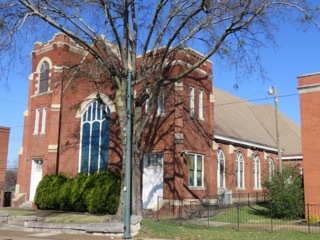 Because of that and its size, it was no doubt meant to be a medium-to-large Methodist church at the time it was built in the mid-1920s, when East Chattanooga was a popular suburb in the eyes of real estate people. A look in some old newspaper clippings tells a little more history, and it is somewhat of a romantic tale. The church reportedly started right after the Civil War as a Sunday school and used a log building by the East Chattanooga Depot. The structure had reportedly been a camp for Civil War soldiers. By 1887, the church, known as the Cottage Church, eventually moved to a structure at Glass and Campbell streets. It was named Manker Memorial Church in the early 1900s, partly in honor of local Methodist pastoral leader Dr. John J. Manker, who would die in 1916 of a heart attack while delivering a talk at the Methodist Church’s General Conference in Saratoga, N.Y. He was a longtime United Methodist minister and local church leader. He was also the father of prominent Chattanoogan Mrs. John A. Patten and the grandfather of Manker Patten, for whom the tennis center is named. The church held a cornerstone-laying ceremony for its building at North Chamberlain and Fairleigh streets in February 1925, with architect James G. Gauntt and contractor Mark Wilson in attendance. Work was completed later that year, and a story said the sanctuary/nave could hold 800 people. A gymnasium was also upstairs. 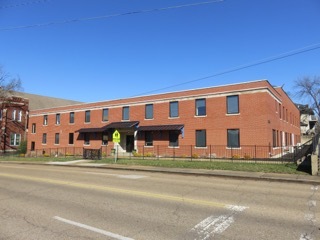 One of Mr. Gauntt’s other buildings in Chattanooga he designed – although nearly 35 years later – is the still-standing DuPont Elementary off Hixson Pike. The pastor of Manker Memorial at the time the church was constructed was Dr. E.S. Stringham, while a pastor there in the 1940s and ’50s was the Rev. Ralph Mohney. He later became a popular minister of the larger First-Centenary UMC in downtown Chattanooga, and his wife, Nell, became a newspaper columnist and church volunteer, who lived until 2016. They had met at an event at North Carolina while he was serving as the pastor of Manker Memorial. In 1959, Manker and King Memorial Methodist, which was located a short distance away at Fairleigh and Taylor streets, merged. Manker had been a Northern church, while King was a Southern church when the Methodist Episcopal churches were separated into groups by ideological rather than theological differences. 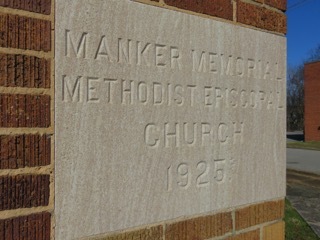 The Manker Memorial edifice continued as the place of worship for the combined churches, although a new name of East Chattanooga Methodist was selected. The church remained there until 1991, when it merged with St. John United Methodist near Highway 58 and 153, and the old Manker memorial building began serving a non-Methodist congregation. 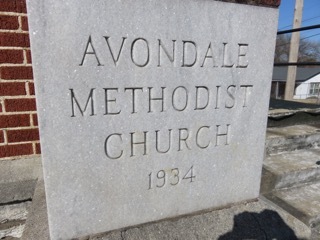 After I walked around that building, I got in my car and drove a short distance to another East Chattanooga area Methodist church building – the former Avondale Methodist. Located at the corner of Dodson Avenue and Wilson Street, it was a building constructed during the height of the Great Depression. The cornerstone says 1934 on it, but an article and photo in the Chattanooga Times from October 1932 said the church hoped to be occupying it by Christmas of that year. What, if anything, delayed the completion is not known. But the 1932 newspaper story does reveal a few interesting details. 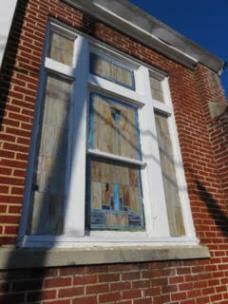 It said that the old Ebenezer Methodist Church had been at that site since the 1880s. Also, the brick for the new church came from the old Davenport hosiery mills plant on Georgia Avenue, which had been razed for the building now known as the Joel Solomon Federal Building. The church had bought 30,000 bricks, and women and children connected with the church cleaned the mortar off them as a donation of labor during those hard times. Both the Federal Building/Post Office and the Avondale church were apparently designed by the same architect – R.H. Hunt, whose numerous buildings still dot Chattanooga. Actually, I looked at an old list I got from the library years ago of some of the buildings R.H. Hunt designed, and he apparently drew plans for all four of the other churches I visited beginning with Avondale. Although it is a little unclear in the stories and available information, at some point the church may have started calling itself Grace Methodist, because around 1948, Grace and St. John Methodist – located nearby at Ocoee and Taylor streets, merged. This could have happened after the Northern and Southern Methodist Episcopal churches, which had split before the Civil War over slavery, reunited in 1939. Since some of them had the same names, they might have taken on new names after the reunification. The combined churches were to start meeting at the Avondale church at Dodson Avenue and Wilson Street after some work was done. And the combined church was to be called Avondale Methodist – apparently kind of a back-to-the-future moment. In 1965, the church announced plans to build a new church at the intersection of Laguana and Hadley drives in Bonny Oaks, and sell the church on Dodson Avenue. The new church in Bonny Oaks would be called Lake Vista. Lake Vista, in 1991, merged with St. John’s – the one by Highway 58 and Highway 153. A glance at the old Avondale church on my visit Friday did not reveal how much the church is being used today. I took a quick peak through the glass front door, and I could see an old water fountain down the hall. A hollow sign frame also remains on the outside. An unusual, house-like structure made of wood connects on the south end of the church. Perhaps this was added during the 1940s merger and was used for possibly the youth. The brick part of the old church and the old windows looked to still be in good condition, although the inside likely needs a little work. One can only imagine the sermons of old being given inside the building during its heyday of the 1930s and ’40 in perhaps the typically Methodist style of somewhat controlled emotion. The church building – located just a few feet from where the new Avondale Recreation Center is being built by Wilcox Boulevard – would still likely meet a historic presevationist’s approval, although it is not as detailed as Manker Memorial. While these church buildings no longer operate as Methodist churches, Stanley UMC farther south on Dodson Avenue continues the Methodist presence in the long lowland stretch on the western foot of Missionary Ridge. Its pastor of recent months has been Richard Brown, whose other job is serving as executive vice chancellor of UTC. I then headed a few blocks south and one or two east to the corner of Dodds Avenue and 16th Street. 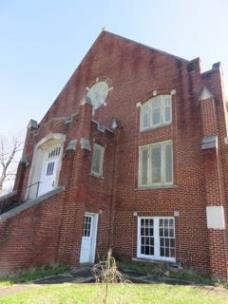 There sits another handsome and well-built brick church, the former Ridgedale United Methodist. This one was built in 1924, within a year of the larger Manker Memorial church, so you can imagine that, like with East Chattanooga, Ridgedale was a growing and popular area in this period of the 20th century. With the slightly protruding buttresses and pre-cast stone ornamentation around the doors and windows like with the more horizontal Avondale church, the more vertical Ridgedale church seems to have R.H. Hunt written all over it. 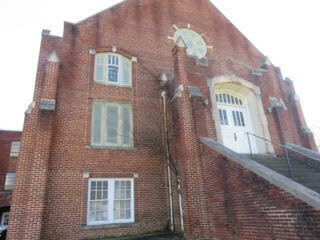 Perhaps reflective of the steep 16th street next to it going up Missionary Ridge, the church and its one double door entrance facing Dodds Avenue is entered via some steep steps, although a less vertical entrance is around back. The church is symmetrical architecturally from the front and features an eye-catching circular window. Ridgedale – originally a part of the Southern branch of the denomination – dates its history to 1888, when it met at Smith Hall by what is now Main Street and Dodds Avenue. A short time later, it began renting space at Hochstetter Hall at the corner of Main Street and Ringgold Road. It then built a smaller church on Dodds Avenue between 16th and 17th streets before building its current structure. 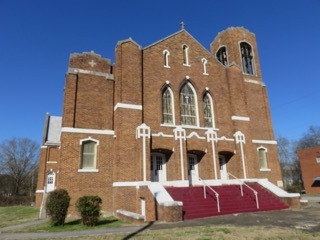 Among the interesting facts about the church are that an early longtime member was Mrs. Anna D. Bass, the mother of 20-year Chattanooga mayor Ed Bass. The church also sent an impressive 23 people into fulltime ministry, including well-known ministerial brothers the Revs. Roy, Marvin and J.N. Howard. A story from 1978 also said then-President Jimmy Carter’s pastor in Washington, D.C., had also attended the church as a youth. The president often attended First Baptist Church there, so it is not clear if they are referring to the pastor of the church, or perhaps Fred Gregg, the president’s Sunday school teacher, who grew up in Chattanooga as the son of a Baptist minister. The church had its heyday in the early and mid-20th century, but with urban flight, it could not sustain itself. In 1993, it merged with St. James to form East Ridge United Methodist on Ringgold Road. As I walked around and examined the church, it appeared to be little used – or at least little taken care of recently. It has a sign in front of it for the Soul Saving Station church, but it was not clear if that church is still operating there. 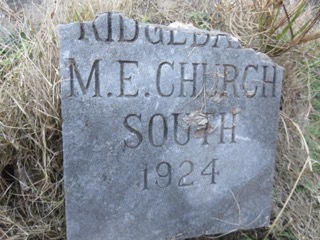 Unfortunately, the old Ridgedale Methodist cornerstone has been removed from its former place and lies broken on the ground below its old location, like an overturned gravestone in an unkempt cemetery. It was then time to start moving a little closer to downtown, so I eventually found my way to Bailey Avenue and stopped behind the old Asbury United Methodist at the corner of Orchard Knob Avenue. 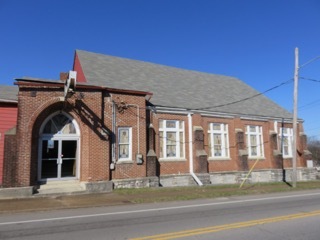 While an average non-Methodist who does not live in this area might not have really noticed that church over the years, it can best be described as one of the old church buildings that was part of the large Highland Park Methodist Church/Tennessee Temple complex. But it was originally a Methodist church, although the congregation did start as Highland Park Methodist Episcopal Church. It was the Northern church, while another Highland Park that became St. Andrews United Methodist was a Southern church. This church is actually about 15 years or so older than the Ridgedale and Manker Memorial churches, as its sanctuary facility was built in 1910. It has a slightly older look and perhaps resembles an old county courthouse in a smaller town with its antiquated–looking red brick. 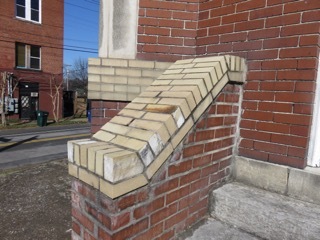 Its tan brick lining mixed in also gives it a nice look. Its front slightly resembles the old Manker Memorial, but its tower has a different look, especially when seen from the side fronting Orchard Knob Avenue. 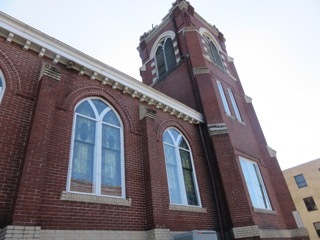 The two-story education wing on the Missionary Ridge side of the church was dedicated in 1953 and was named after Shelby Brammer, an attorney and lay member of the church who had been in charge of raising funds for it until his untimely death. His wife was Dorothy Brammer, later Hamilton County register and secretary of the Armed Forces Day celebration committee. During the 1953 dedication, 11-year-old Shelby Brammer Jr. pulled the string unveiling a portrait of his father. 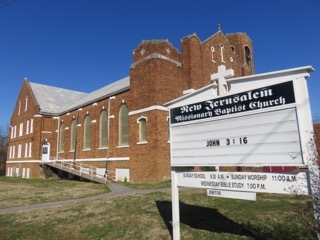 Asbury at that time had a healthy membership of 1,200 people, but like many Methodist churches near downtown besides First-Centenary UMC, its attendance began to wane after that. While talk of merging St. Andrews, Ridgedale and Asbury surfaced, as did talk around 1970 of selling to Highland Park Baptist if Asbury made other plans, neither of those discussions materialized. 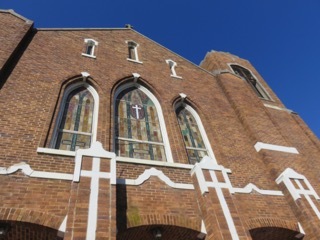 However, after its membership did continue to decline, the church members joined with Brainerd UMC and the building was sold to Highland Park Baptist in 1985. Today, the old Shelby Brammer building appears to be used and updated, but whether the sanctuary is was not clear. Redemption to the Nations Church now occupies some of the old Highland Park Baptist Church physical plant. 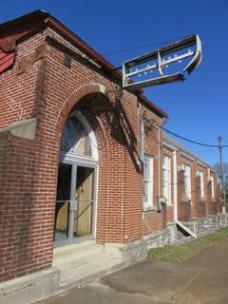 The last former Methodist church building I visited was the old St. James Methodist Church building. If that name or location does not sound familiar, what if I said the building is now the Church on Main, Southside Venue, or that event center on Rossville Avenue a few feet away from the now-trendy Main Street corridor. 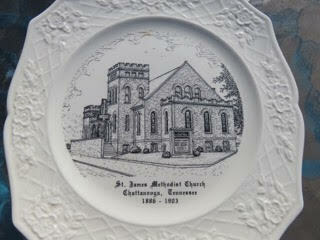 When my wife and I looked at the plate with the picture of the old St. James church after she bought it, we assumed it was a now-torn-down church somewhere near Rossville Boulevard. But it is a well-taken-care-of old church building with updated, but not-so-churchy-looking windows. St. James Methodist church, which was a Northern church, had been around since 1886, and this present building was dedicated in 1903. The Rev. George E. Blanchard began serving as pastor in 1932 and stayed an unusually long time at one church for a Methodist minister. However, due to a declining congregation or perhaps the move to the suburbs that was becoming popular, they moved out to East Ridge near Prater Road in 1957, with Rev. Blanchard continuing as minister. In 1993, they merged with Ridgedale to become East Ridge United Methodist. 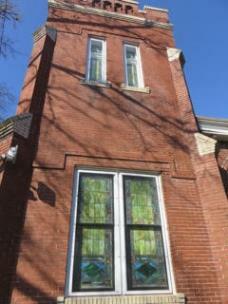 According to some historical information at the Church on Main website, the building later served as home to New Hope Baptist from the 1950s to the 1970s. 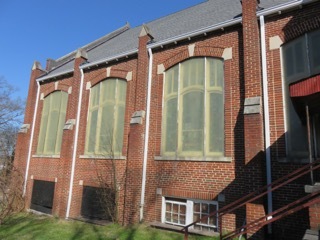 It became an event space in 2012 after being renovated and also began being used by the Relevant Church congregation, with services at 10 a.m. on Sundays. The church has a nice tower and arched breezeway portico that make it an eye-catcher in an area of interesting architecture, with a hint of Richardsonian Romanesque influence. These five church buildings of varying levels of physical condition and amount of current usage are quite a glimpse into church and Chattanooga history, not to mention a study in early 20th century architecture. Studying them is also a glimpse into the time when church in general was collectively a greater part of people’s lives and a period when the Methodist church – two branches and all – wanted to put a church every mile or two in Chattanooga. Of these five churches I visited, their stories of both their past and present are different from each other, but they all share the same historical stories of trying unsuccessfully to survive where they were. However, they did manage to collectively impact a few lives positively in the name of Christ along the way.